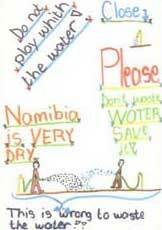 NaDEET’s Response: At NaDEET Centre, practical lessons are used for children and adults to learn about and implement water saving methods. 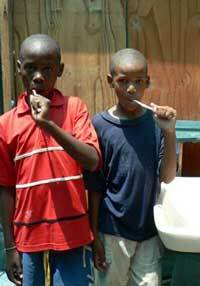 To reduce water wasting in our bathroom facilities, we have no taps that can be opened and left running. 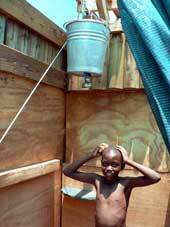 Instead there is a tank with limited water which participants can use for the bucket showers, brushing their teeth and washing their face and hands. The Centre has long-drop composting toilets instead of flush toilets. 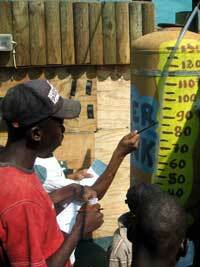 Participants count the group’s water use on a daily basis using water meters and the water tanks. 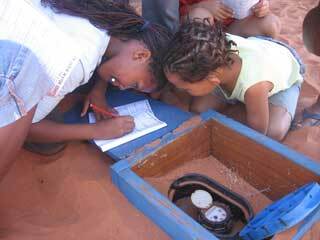 Children gain experience in how to measure their own personal water consumption. 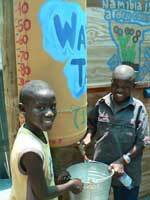 NaDEET Centre provides a water bottle for each participant to use throughout the programme. Cleaning of the kitchen and dishes is done in small teams to reduce water use and water is reused for the compost. All of these ideas help to save our precious resource! Through various activities learners explore the water cycle. 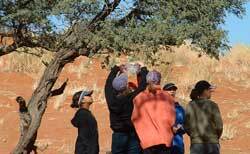 Children at NaDEET also study indivdual processes specifically important in a desert environment, such as transpiration.